The social polarisation of a globalised world continues. Toxic discourse around ethnicity, identity, citizenship, belonging and nationhood has led to the fracturing of communities along the lines of skin colour and accents rather than shared values. And although societies are far more conscious today to not tolerate racism, what is clear also is that fear and suspicion still breed ignorance, prejudice and bigotry. They become the stones that fuel xenophobic, populist movements rooted in reactionary politics. The far-right have returned to increasing prominence, their racism masquerading as faux liberalism. Pulsing darkly through their movements remains a deep-seated dislike of those they see as ethnically and culturally different. With politicians increasingly unsure of how to defeat them, we risk veering towards the creation of right-wing, authoritarian societies not wired with empathy but natural hostility towards others. 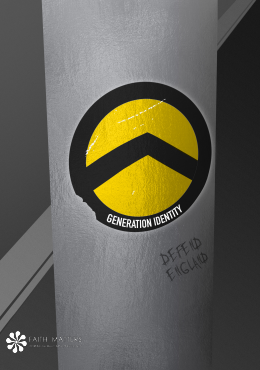 The focus of this report will be on Generation Identity, who they are and what they stand for. In the wake of a global refugee crisis triggered by conflicts in the Middle-East, far-right groups such as Generation Identity have emerged portraying immigration and multiculturalism as physical and moral threats to their ways of life.